Out of a possible 1,000 points, the top 10 teams all earned over 90% - high marks indeed for such a rigorous competition. Poor Team West Virginia, they were plagued with problems throughout the competition and, along with Team Texas finished way off the mark. The California teams had a mixed showing with best overall finish going to Team Stanford, followed by Team USC (Fight On! ), right behind them was Team Santa Clara, and bringing up the rear was the combined team from Caltech and SCI-Arc with their ambitious, but unorthodox split-house design. We toured the houses twice - the first time on the eve of the official opening and then again last Thursday - an official day for the event and the crowds were decent despite being in the middle of the work week. We will admit that it looks pretty cool - but we really couldn’t get behind those outdoor drapes - really? Nice concept and all, but how long would those last in the real world? The judges, however, were not concerned. Run on Sun favorite, Team USC, was not without their bragging rights, earning a perfect score for energy balance, placing first in Appliance efficiency and third in Architecture. But then when you have an Eames Elephant roaming your halls, you know that your architectural chops are well established. The Appliance competition was as tight as a tick with the top five teams separated by less than one point! I’m sure the folks at Bosch - who supplied the appliances (and solar modules) to USC’s fluxHome entry - will be happy to point out the team’s success in this very competitive field. On the street-side of the house is a wall 16″ thick made from four inches of concrete (made sustainable by substituting fly ash for cement), six inches of insulation and then six more inches of concrete. That thick barrier was designed to insulate the house’s occupants from the noise of the city and allow them to turn their gaze to the south - the Eden side of their home. The living wall is filled with plants and a drip irrigation system which also incorporated a reflecting pond - part of the rainwater capture system - which was actually put to the test when an unseasonable deluge moved through the village the day before. For us, this was one of the better thought-out concepts and the execution was really impressive. Oh, and another clever feature of the house was the movable solar array. While not a tracking device, the solar system was mounted on rails that allowed it to be extended over the patio/deck area to provide shade in the summer (as it was during the competition) or retracted back over the house to allow more sunlight into the house during the winter. Throughout the village, the creative students from all across the country and all over the world, demonstrated again and again that sustainable living need not imply some terrible hit to one’s standard of living. Clever designs, competent craftsmanship, and attention to detail was everywhere on display. This was a great event both for the public who toured these houses and for the students who designed, built, and all but lived in them. They are all winners - congrats to them all! And now, bring on 2015! People's Solar Decathlon Choice - Team USC? 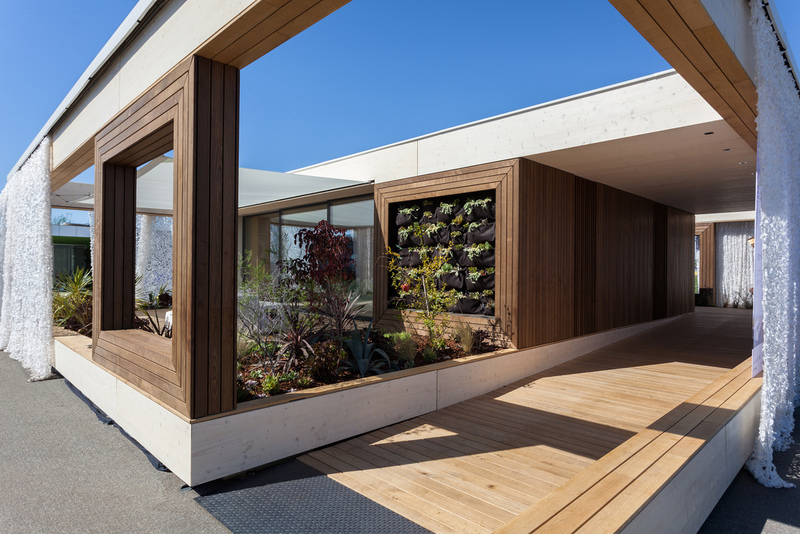 The 2013 Solar Decathlon is well underway and one important competition is actually not only open to the public, it is determined by the public. Here’s how you can play a part! Thank you for your support of the USC Solar Decathlon Team thus far. We have one more request: Vote for #111, Team USC, in the People’s Choice award! All you need is an email address. Votes must be cast before 11:00 am on Friday, 10/11/13. Please pass the link around to your family, friends, and colleagues. We need all the votes we can get - together, we can win this! So there you have it - do your part to support our local team by clicking on the link above and vote for #111, Team USC! The 2013 Solar Decathlon is taking place October 3-13 at the Orange County Great Park in Irvine and they need volunteers - if you’ve got the time, this would be a great gig! Regular readers of this blog will know that we have been actively involved with Team USC and their fluxHome entry into the competition - and things are moving along great for them. But for the overall competition to be a success, lots of volunteers are needed and that’s where you come in. The Orange County Great Park is very excited to announce volunteer opportunities with Solar Decathlon 2013 and XPO! When: Event dates are Thursday-Sunday October 3-6 and 10-13, 2013. Volunteer opportunities range from September 22-October 17, 2013. Experience the excitement of being an important part of the West Coast debut of the Solar Decathlon and the first-ever XPO clean, renewable and efficient energy exposition as a volunteer. Hundreds of volunteers are needed for roles that include greeters, docents, production assistants and more. The volunteer experience promises to be unforgettable and rewarding. Volunteers will feel the passion and excitement of the 20 collegiate teams competing in Solar Decathlon 2013 and work side-by-side with event organizers as well as other volunteers from all over the United States and the world. - To register an individual volunteer, please visit http://www.solardecathlon.gov/volunteers.html . - To register a group, please contact volunteers@confluencec.com or call at 442-600-1204. - For more information, please visit http://www.solardecathlon.gov/volunteers.html. - Please print or share the attached digital flyer (Recruiting-Flyer). We spent yesterday with the great group of folks from Team USC working to re-install their solar PV system. Here’s our update. Although the Team had the house entirely complete for the Send-off Celebration, it had to be deconstructed into its three component pieces for the trip down to Irvine. That meant cutting open drywall and unbolting sections from each other before the three sections could be loaded onto trucks. But it also meant that the solar array, which actually consists of four branch circuits, had to be partially disassembled since three of the four cross section boundaries. Yesterday’s task was to restore those connections in a manner that was up to code - since these houses need to pass a rigorous inspection process before being hooked up to the local “micro-grid” - and help the Team stay on track. With all of that activity going on, the competition organizers were taking no chances with safety - everyone entering the competition area was required to wear hard hats, eye protection and proper foot protection. When working on the roof - where I spent the most of my day - harnesses and fall protection gear were mandatory. In fact, if a team member is spotted without proper safety gear, the team is docked competition points. A powerful incentive to follow the rules and maximize safety - always a good lesson to learn. In the foreground you see the massive, automated skylight that forms the aperture for the “solar chimney” that is an integral part of the home’s systems. Behind the skylight is a portion of the solar array. While Team USC has not suffered such a depressing fate, they could still use your support. So if you would be interested in contributing to the team, you can jump over to their Support page and make a donation. Finally, while we were taking a break on the ground, we came across a film team that was documenting the Team’s progress and they told us about this video that was shot while we were doing the initial installation. The entire video is well worth watching as it documents the efforts of the four teams from California that are competing this year. But we have to admit, we are partial to the section that begins around the 35 minute mark - and stick around for the happy conclusion after the break! Best of luck to all the schools competing, and especially to Team USC - Fight On! The 2013 Solar Decathlon is right around the corner with the Opening Weekend October 3-6 at Irvine’s Great Park. As readers of this blog know, we have been assisting Team USC (Fight ON!) with the solar aspects of their entry and we will be going down to Irvine on Wednesday (tomorrow!) to assist in reconnecting the array. Team leaders Evyn Larson and Jason Kang share the stage before the start of the send-off celebration. Interior view of fluxHome looking toward the kitchen. That is Gary on the left talking on the cell phone - no doubt trying to make sure that some still missing piece of equipment arrives in time. Speaking of equipment, the equipment room certainly became a lot more crowded than it was when we were doing our install! Fortunately, the supremely-talented Velvet was able to route much of our conduit on the back side of that wall, leaving critical wall space for other components. Good planning! I wonder if they can get them to take a road trip to Irvine - talk about a home field advantage!